You are viewing comment page 173 of the post. View the post contents here. I am the owner of an Asus Xonar Essence ST sound card, with a Asus P6T motherboard with a Windows 7 installation. I use the UNi Xonar 1823 v1.80a r3 driver. I have run a batch of tests to ensure that what goes out the line-out analog output was a good signal. To do these tests, I went from a 24bits/96kHz recording I did from an analog tape player to a portable digital recorder. The spectral view of the original file goes like this. 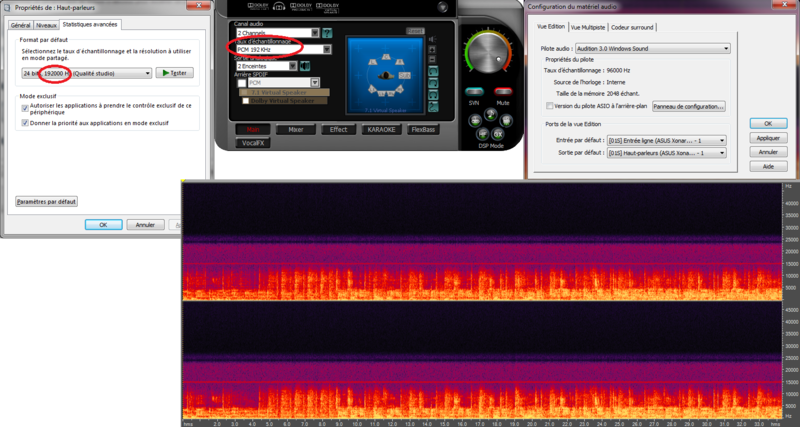 As you can see, there is a line at 33000Hz, which would not be there with a 48kHz file. Then, I play the file using different softwares and settings, and plug in my recorder on the soundcard’s line-out and record at 96kHz again. 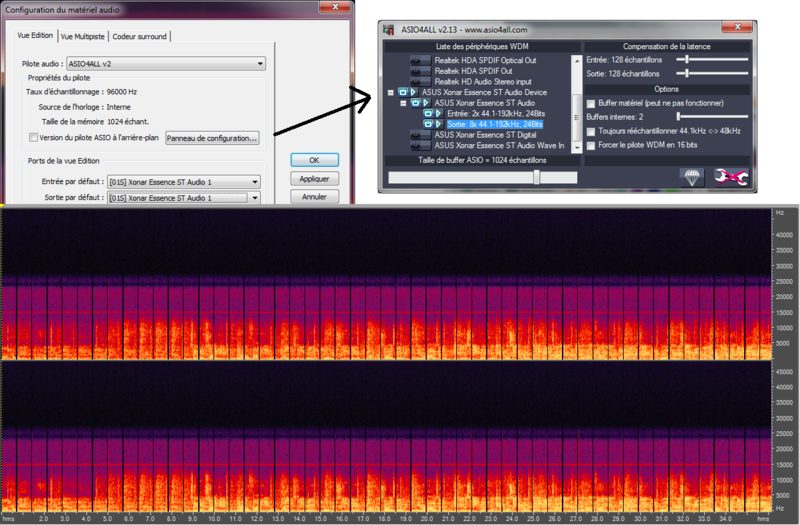 However it proves that the soundcard has the hardware capabilities of rendering such a signal. Note that the ADIO control panel is greyed out. This time I have configured ASIO4ALL to use the hardware buffer. 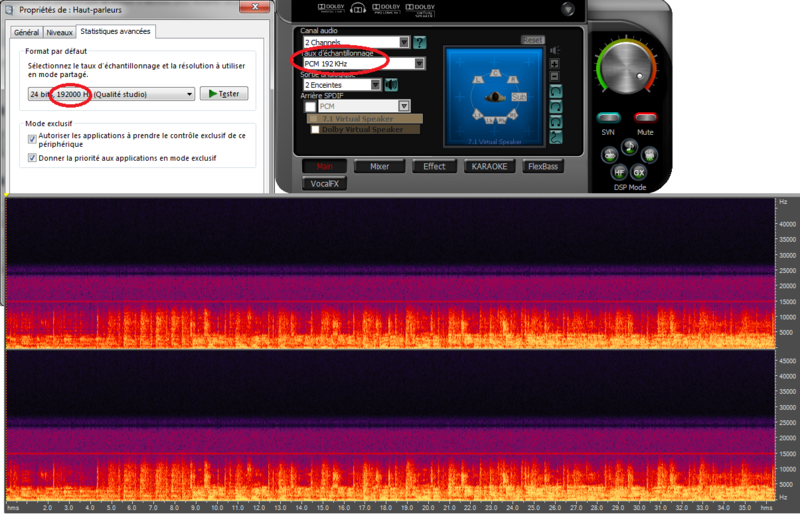 However, it seems the setting is stuck at 44100Hz, and the output looks resampled at this frequency. Unfortunately, I haven’t managed to make any winamp ASIO plugin to work. But I’ve found the Kernel Streaming plugin which is supposed to by-pass the system’s interface and directly handle the driver. Unfortunately, the output is no better than the test #7. To conclude, it seems that the hardware has the ability to render 96kHz audio; but some software configuration seems to be interfering and it is quite frustrating. I’d be very happy if you could point me to a way to investigate. I have no idea if this is caused by the driver, some system’s configuration, or a third-party software interfering. Unfortunately, I don’t have the means right now to make a new fresh install of Windows 7 w/ only the driver installed; not to run the same tests with the digital S/PDIF output. You should try 1.75a and 1.80b drivers. 1.80b has newer ASIO drivers. If those do not work better, you could try the WASAPI output (winamp will require a plugin to support that). For DirectSound, ASIO4ALL and KernelStreaming the Windows Playback and Asus Xonar Audio Center sample rate settings should be set to those of the source material. Thank you for qui quick reply! I’ve changed Windows Sound’s setting at 96kHz, as well as Asus Control Panel’s settings. Then I played my file with Winamp using Direct Sound output plugin, Kernel Streaming output plugin, and the latest version (1.0.6) of YASAPI (the WASAPI plugin). Then, I uninstalled ASIO4ALL and uninstalled the 1.80a driver. I restarted the computer, then installed the 1.80b driver. Then restarted the computer. Then set up windows’s sound and asus control panel at 96kHz. Then restarted the computer again. I re-run the same tests with winamp and the 3 plugins (Direct Sound, Kernel Streaming, YASAPI), and still got some same results. Have you ever tried to run the same tests?! I’m pretty sure it’s a Windows-related issue with a part within the system resampling the signal; but I’d like to know if I’m the only one to have such downsampling, or if it happens to many installations? 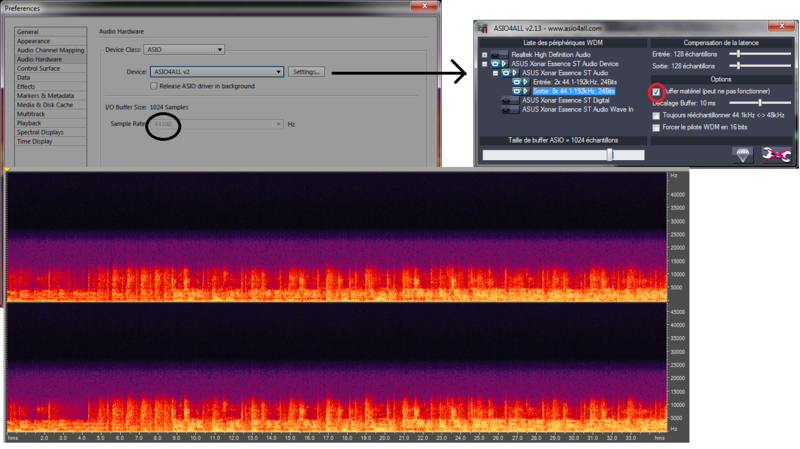 Are you using a file that is 96khz for playback? Yes, this is what I said in my first message: “I went from a 24bits/96kHz recording”. The file I use for playback is a WAV PCM 24bits 96kHz. Hello. I don’t have Adobe Audition 5 and at the moment I do not have time to investigate this a issue. I think you are the first to bring something like this up. You could try and see how the onboard audio performs, that could answer if it’s Xonar related or something else. Any clue why the installer doesnt pick up any addons? Extracted the standalone pack in the same folder. Even tried creating an Addons folder to put it in, nothing detected. You’ve replied to someone else’s comment instead of posting a new comment. To post a new comment you need to use the comment form at the bottom of the comment section. Please redo your comment as a new comment. First of all, thanks so much for the great work you’ve done on developing these drivers. Now to my issue. Since Windows 8.1 x64 (currently on Windows 10 through an upgrade), I have had issues with sound completely cutting out. It seems to happen entirely at random, and may take place a few minutes or even a few hours after playback. Restarting the Windows Audio service always fixes it, but that’s obviously a band-aid solution. I have tried numerous drivers, both the official Asus ones (latest version as of this writing) as well as several UNi Xonar drivers since version v1.72, but the issue still occurs. There is no static noise of any kind, any playback simply stops in the blink of an eye. When sound drops, Windows still states that “This device is working properly” in Device Manager. An interesting thing to note is that I can still test speakers using the C-media Panel – the “Left front” / “Right front” test playbacks still work. At this point I’m suspecting some sort of core Windows Audio corruption. I’m running a Xonar DS. If you go to Event Viewer-> Applications and Services Logs-> Microsoft->Windows->Audio->Operational, are there any warnings or errors at the time of the issue occurrence? I too think that is may be Windows related. If you haven’t updated Windows in a while maybe you should do that first and check if you still get the issue. You could launch a cmd window as administrator and type: “sfc /scannow”. This will scan and attempt to fix any corruption issues with the Windows files. Secondly, it could be a issue with the motherboard. You should look if there are any new bios updates. You could also try the card in another PCI slot. BTW I appreciate your donation. There are no errors or warnings listed in the Microsoft-Windows-Audio/Operational Event Viewer log. I always keep my installation fully updated through Windows Update. I did not have this issue when running Windows 7 Pro x64 and at that time I used the same BIOS version as now, so I suspect the issue is not located there. Incase the sfc /scannow run did not help, I think my best bet is to probably do a reformat + reinstall. You always had this problem since moving to Windows 8.1? I’ve seen stranger things happen because of the motherboard and where solved with a Bios update. But you are right to be hesitant as there is a small chance you could ruin your board. And we also don’t know what changed until v2.20. Which bios version do you currently have installed? Depending on how old it is compared the v2.20 it might be worth purchasing a bios chip flashed with latest update. As there aren’t other reports with issues like yours it is difficult to pin down the problem be to more sure in which direction to go. The issue started a few months after updating Windows 8 to Windows 8.1, so I cannot say for sure if it was the update itself which caused it. However, during my 2+ year usage of Windows 7, I never experienced the issue. I’ve never flashed the BIOS, so it’s pretty old by now. I’m running v1.10. I understand it’s difficult to troubleshoot and in all honesty I doubt the UNi Xonar drivers are the cause of this issue. So I tried physically removing the Xonar DS card and wiping all drivers using the uninstaller found here on the site. I also ran Driver Sweeper afterwards to wipe both Realtek as well as Asus sound card drivers. I enabled on-board audio and used the default Win10 High Definition Audio Device driver. Turns out that the issue still occurs, so now I can safely say that it is in fact not related to the Xonar DS card itself. Today I also noticed warnings popping up in Microsoft-Windows-Audio/Operational Event Viewer log, both with and without the Xonar DS installed. “Windows Audio encountered an error while processing a device event. Good thinking testing with only the onboard audio card. I’m not sure what that Warning in Event Viewer means. Does the warning time stamp coincide with when the issue happens? Another thought, could the issue be with a specific player or a application that you are using? When sound cuts off if you try playing audio in other players does it work? Yes, the warning appears when sound disappears. It’s not related to a specific application. The issue can occur no matter which program plays sound. This weekend I decided to do a reformat and clean install of Win 10 x64. So far I haven’t experienced the issue again, so it looks like some sort of Windows corruption indeed was the cause. Running the latest UNi Xonar Drivers as of this writing. I have an asus xonar essence st on a gigabyte H81M-HD3 rev2.0 motherboard. When I’m using foobar witha asio drivers and asio xonar output I have a problem. When music is playing and I scloll the library in foobar I get glitches or audio stack. When I’m using jriver with asio output and asio drivers happens exactly the same. When I’m using motherboard realtek output with asio drivers I have no problem. If I use asio4all output audio is not working unless I go to unixonar panel and clich unclick and click again the spdif output. When audio is working and sroll the library I have again glitches…. with wasapi from the other hand everything works fine. The above problem is happening with windows 7 8 and 10. I’m disappointed. My essence st was installed in another pc I have and worked fine always with any driver. Couldn’t install Asus drivers for my Xonar Essence STX after I upgraded to Windows 10. This works lika a charm. Thank you!! I have a small problem that may not be directly connected to Uni drivers. 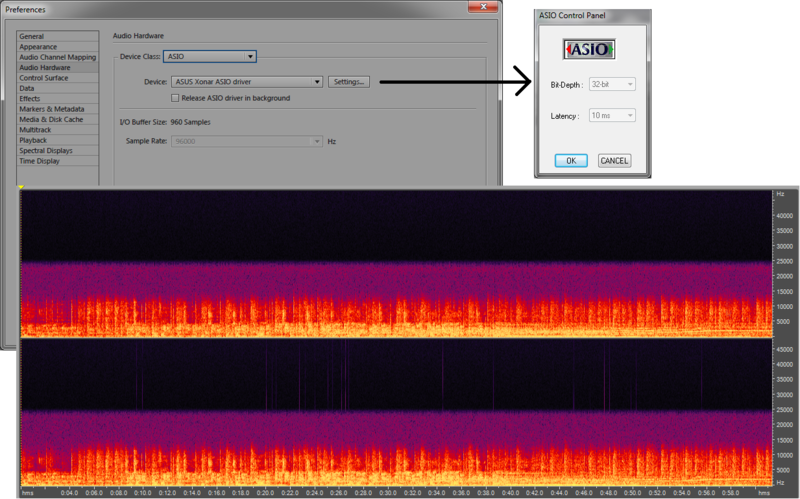 I use AIMP3 software to listen to music and I use Wasapi or ASIO for playback. With either of them, whenever I listen to music and browse Chrome at the same time, I get slightly popping and delays (as if the computer takes time to load Chrome first, ignoring the sound, and then continuing). So my question is: shouldn’t ASIO and Wasapi work directly with my sound card without being dependent on the CPU? Secondly, my CPU is an i5 2500 so it should be more than enough to handle both a music player and a browser? I’m very happy with AIMP3 otherwise, however could someone recommend other players for direct sound playback like ASIO and Wasapi? Thanks! ASIO and WASAPI do not bypass the CPU, they bypass Windows Audio mixer. ASIO at least in Xonar drivers implementation requires more CPU than DirectSound or WASAPI. Chrome takes all the CPU power you have if you have more tabs opening at its startup. I suggest you use the WASAPI output and try setting AIMP3 process priority higher. You can do this in AIMP Options->System-> set the Priority slider on the right to maximum. Note that if you use a Process Lasso, it will interfere with your set process priorities and should make some changes there as well. If that does not improve the situation switch to WASAPI non-exclusive output, that’s what I use and I don’t have any problems. Don’t think this is a issue with AIMP3. I consider AIMP to be the best audio player at the moment but if you wish to try with another player then try with foobar2000. Wow that’s a very helpful answer, thanks! I switched priority to highest and it solved the problem, I think. By the way I use ASIO by installing “ASIO4ALL V2” and by selecting “ASIO: ASUS Xonar ASIO driver” playback. Is it better to select this playback than just ASIO4ALL playback option? 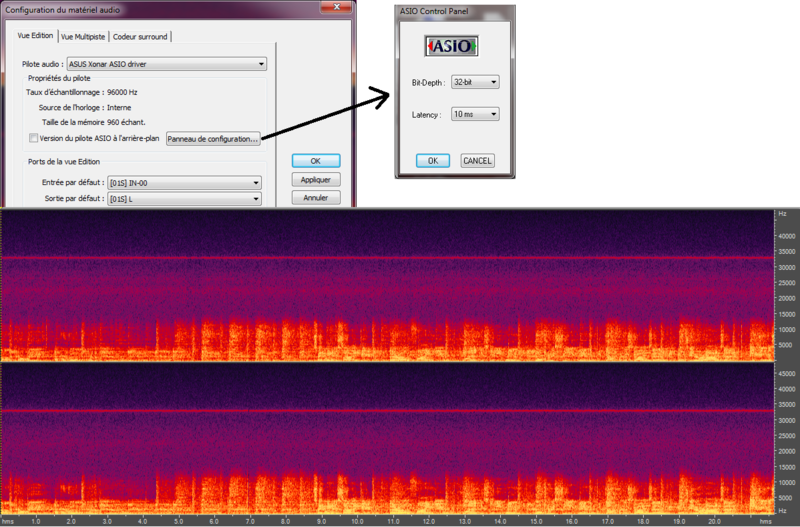 Is this the correct way to use ASIO through AIMP3? Are there other ways? By the way when I select WASAPI exclusive playback, other sources of sound do not turn off anymore (like youtube). It used to. What could have changed? Should I use Event or Push WASAPI? Thanks your your patience! ASIO4ALL is a 3rd party ASIO driver. You can use either the one with the drivers or the ASIO4ALL, don’t know which is better, I personally think that for Xonar cards the WASAPI implementation is better than ASIO and WASAPI should be just as good as ASIO in regards to sound quality. WASAPI exlusive playback issue is strange, are you sure you’ve set WASAPI exclusive and not WASAPI non exclusive. Anyway it might be because you’ve unticked “Exclusive mode” checkboxes from “Windows Volume -> Playback devices -> Speakers Asus Xonar(..)-> Proprieties->Advanced tab” or because of a issue with the drivers if you’ve installed v1.80a. If you’ve installed the v1.80a drivers try the 1.75a instead and see. Use WASAPI Event if that works fine for you. Also try to disable the “S/PDIF Pass-through Device” entry of the Asus board in the Windows audio playback devices. It was causing the same problem to me in the past. Thanks, disabling “S/PDIF Pass-through Device” helped me solving having only stereo sound via my asus xonar hdav1.3 (after upgrade to Windows 10 and install of 1.80 drivers). I now Have Dolby sound! Do you have a theory pertaining to the problem addressed here? I’ve had this issue for as long as I own the card, on rare occasions I will get ear raped with heavy distorted sound, and ringing, causing me to throw my headphones off in shock. So far, in that thread, there seems to be no fix, and I’d like your take on it and if you’ve heard of this happening before? I’ve seen a couple of reports with this issue. Ever since I have the Xonar DX card (2008) I myself haven’t had the issue. I don’t know of any fix for these issues. It occurs to me that it might also be different issues and causes that sound similar. My thoughts on what it could be: 1) A compatibility issue with some motherboards that would make the Xonar cards malfunction at certain points. I’ve seen some strange compatibility issues with motherboards and Xonar cards so far. An example. In my search on cases with high volume white noise I’ve come across one case that supports this theory (link). 2) Some Xonar cards have a hardware issue with one of their components. My recommendation is to either move to a Creative card, buy a external DAC or at least take some precautionary measures like controlling the volume with a amplifier while having Windows volume always set to 100%. Nothing is worth permanently damaging your ears. Sonar DG Asus card . The sound is very good, Xonar DG Audio Center have activated Mixer – Strengthening MIC microphone – microphone . Microphone helmets and work on a laptop, I put 1.75a drivers do not work , either above , I have disabled the BIOS from an on-board card, when the active had not worked. Any idea or possible solution ?. Your card might have a hardware defect and that’s why the microphone isn’t working. Sometimes the sound from a video just stops working and I just hear static sound. It only happened to me on Youtube videos, not while I use players like VLC or MPC. It only stops when i close the tab and then I get a very high pitch sound. I need to shut everything down from the C-Media Panel. It happens something like once a day or so. I have the Asus Xonar Essence STX, on the v1.80a r3 driver. Hi. I don’t know a solution for this issue. There are other people discussing the problem here. Please clarify what you mean by “I need to shut everything down from the C-Media Panel”. I disabled it and enabled it in the mixer tab I think. This problem did not appear until I installed Windows 10. I Have the Xonar D1 and running on Windows 10 64bit. Sometimes i have only sound on the left side on my headphones, i have google the problem and it seems that many others has that problem. But the thread ended and it is to old for an answere. It only worked when i restart my Computer but it is really annoying, so i have try to disable and reenable my soundcard in the device manager. But then i have to restart to. Is there any way to resete the soundcard without to restart? or better is there a real fix? I don’t know of any permanent fix for the issue. A better way to fix this is to put your computer to sleep and then resume it. The hole operation would take like 5-10 seconds and you won’t have to close the audio applications. Sleep is available if you have Standby set to S3 in bios. I have both speakers and headphones connected to sound card. But headphones to work as headphones must be connected as front speakers. Co i connected front speakers as rear speakers. Is there any way to swap front speakers with rear speakers or change headphones jack to be rear speakers ? My advice would be to use the pins on the card that are meant to be connected to a headphone jack built into the front of a computer case. That way you can hook up speakers and headphones at the same time and switch between them more easily. I have a Xonar D1 audio card and am running win 10 64 bit with the latest drivers (UNi-Xonar-1823-v1.80a-r3). I installed the low dpc latency version of the driver in hope to get rid of any unneaded hiccups in sound. After restarting the PC I noticed I still have a high dpc latency around 1000 us. However, I do use a astro mixamp since I was suggested to do so because I use the sennheiser game one headset which has a low impedence of 50 ohms. The amplifier is connected to the sound card via TOSlink optical cable. In the C-Media Audio panel i use six channels and S/PDIF output is set to dolby digital live. I the windows playback devices i set the default device to S/PDIF pass through device. Is the amplifier unnecessary? Then your high DPC latency is not from the Xonar drivers. You may want to check The case of DPC latency – Part 2. If your amplifier is connected through the TOSLink optical cable then it is not an amplifier it’s a DAC with amplifier. This bypasses the Xonar’s DAC and op-amps when used with digital outputs (TOSLink, S/PDIF) so it makes your Xonar D1 kind of useless. Maybe your DAC has the option to connect it to the soundcard using analog cables. Xonar D1 has the impedance of 100ohm and its recommended that soundcards output impedance should be lower than the headphone output impedance, but your headphones might sound fine connected directly to the soundcard. I don’t recommend connecting the headphones directly to a Xonar card because of a issue with high pitch noise that some people get with their Xonar cards. If that would happen it could damage your hearing. Thank you for your quick reply. Unfortunately, my headset (Sennheiser Game One) has ony a 3.5 mm jack so I can only plug it into the rear jack of the sound card without utilizing dolby digital output. Is it possible to use some sort of converter which would enable dolby digital? I use the Astro Mixamp pro to utilize virtual 7.1 surround which in my opinion sounds pretty good. I found a guide on youtube on this subject. Do you think I should ditch the mixamp and get another soundcard which has a built in amplifier for headphones? The sound quality seems pretty good right now though. I noticed strange problem on my DGX. Some sounds, especially short sounds like windows sounds have a “crack noise sound” at the start of the sound. this is only the case if you have no sounds running. if you listen to music then I didn’t noticed this problem. This problem is Esspecialy noticable if I jumping around on a youtube video stream or just pausing it. Any solution? I’m using v1.80a r3 – C-Media AP. And just one more. I’m using Win 10 Pro. I think I found problem … If I turn off smart volume (SVN) crak noise dissapear. “Audio re-starter for sound loop problem for Win Vista/7/8” is a good idea, but has a wrong title, but is also lacking a couple of important lines. It should actually be named as “driver restarter” and to be used for any (?) audio problems. It’s a must have tool for this horrid driver. Should run at Startup by default. According to the problems I had, I dumped this batch and wrote my own special Xonar Driver Restarter tool for resetting my Xonar DX1. 6. Start Xonar DX Audio Center, and driver is ready to use. Killing the Xonar DX Audio Center first is very important. Thanks for the suggestions. Maybe you can share your driver restarter script with us. Which high-pitch issue you where getting, the one triggered by YouTube in Windows 10 or the general one (regardless of OS, application used)? I don’t think the driver leftovers are/where the problem cause people been having these issues on clean windows installs. Depending on which of the high-pitch issue you where getting maybe one of the Windows or browser updates fixed that. Anyway keep us informed if you start getting the high pitch issue again. The high-pitch issue on Windows startup. Then I just restarted the driver and it was okay again. By high-pitch I think you mean +9000% volume, don’t you? But I haven’t had that issue after something fixed that. If it’s not the leftovers from official trash install, then either CCleaner, Glary’s or Auslogic’s fixed something. The only issue I currently have occasionally, is 0 audio output after Windows startup. All audio software panels show that there should be audio, but there really isn’t. For that I have my Xonar Driver Restarter utility starting up with Windows, so I could perform audio test fast and then restart the driver if necessary. I programmed it to work on my PC. Maybe it might give inspiration for a more universal solution? So you have the high volume pitch at Windows startup and not the one thats triggered randomly at any time? Which OS do you have? If you had GX enabled previously then the driver crash was from that. About the driver restart script, I would like to look at your solution for inspiration. When I have more time I would like to make a C++ tool. You can send me your script by email or post it to a file sharing website. You can find my e-mail in the About page. Thanks. I’m planning to buy a Xonar DSX for the DTS connect capability exclusively (I have an x-fi forte right now, but due to IRQ issues it has the usual problems). I just checked and Xonar cards won’t work in MSI mode. Sigh… thanks for the quick reply anyway. In your experience how sensitive are Xonar cards to IRQ/Latency issues? I don’t know what to tell you about that. How can I debug the sound card to make sure? If you can try the card in another system, that will tell you if the card is really the cause. Can this be fixed or is it not possible to do so economically? Also is trying on another system the only way? It might have something to do only if currently your cards EEPROM is overwritten. If EEPROM correspond with the one of a Xonar DG card then that is not the problem. ATM we don’t know what is wrong so how can we know if it is possible to fix? Any tips on debugging it,to find out?